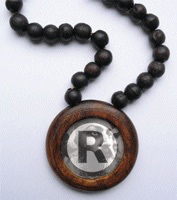 THE CONTENT OF THIS WIKI PAGE (NAMED "Trademarks and copyright") IS WITHOUT PREJUDICE. 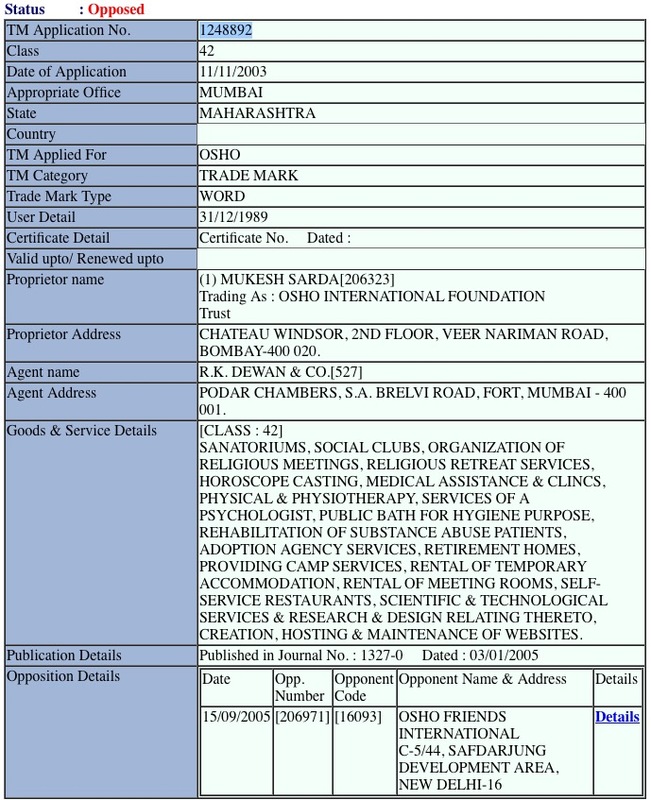 The majority of trademarks in connection with Osho have been filed by Osho International Foundation, Zurich. Like most multinational corporations, OIF has filed trademarks around the world incl. Australia, Canada, the EU, Japan, Korea, Mexico, Russia, Switzerland, Turkey and the USA. Trademarks have been filed with national trademark offices and international organisations like the European Office for Harmonization in the Internal Market (OHIM/OAMI/EM) and the World Intellectual Property Organization (WIPO/WO). 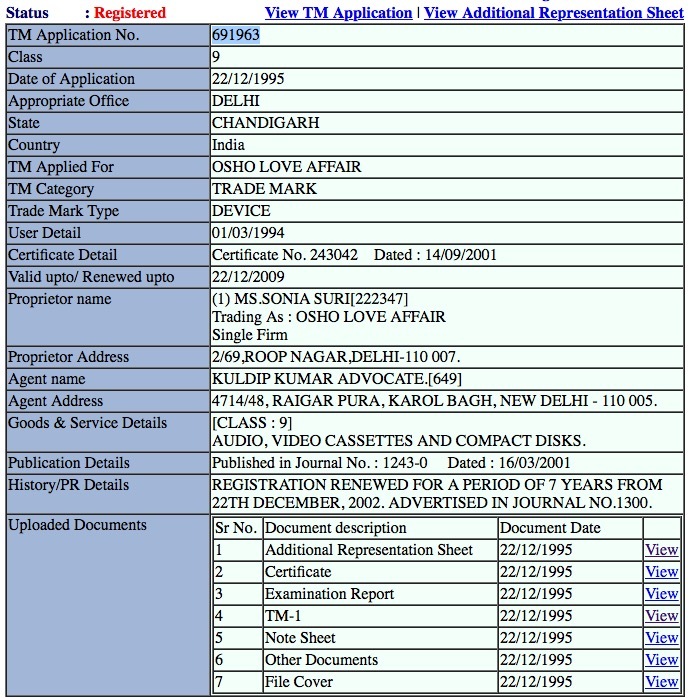 The trademarks that have been filed are shown in the table below. 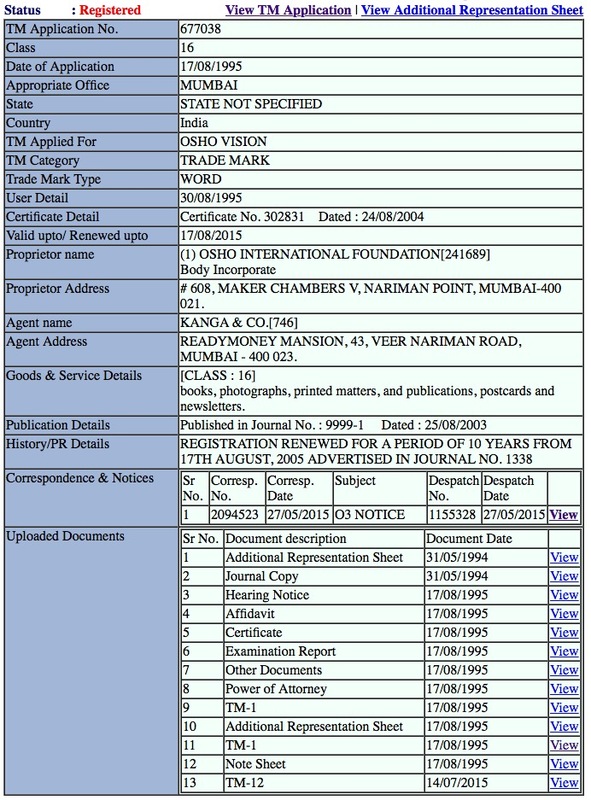 YEAR-MM-DD Magenta : Active trademarks One or more countries where the mark is valid. 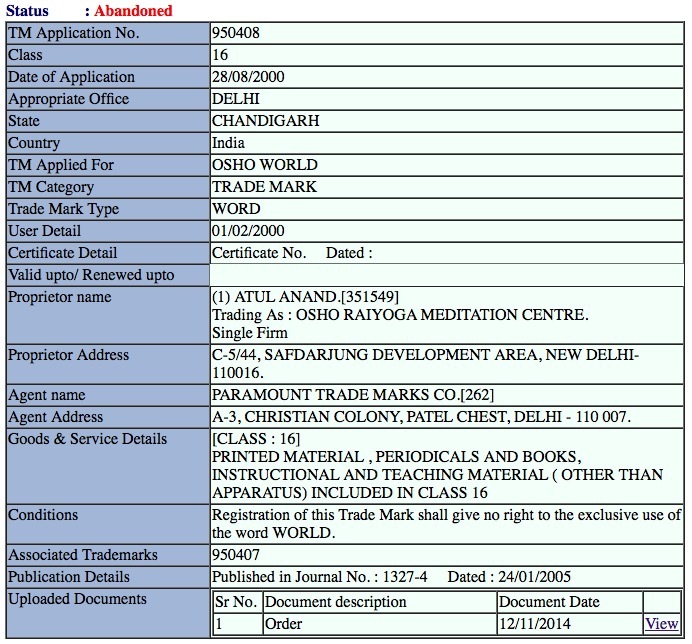 Based on OIF's trademark claims for the word 'OSHO', OIF claimed control of the word 'Osho' in domain names. 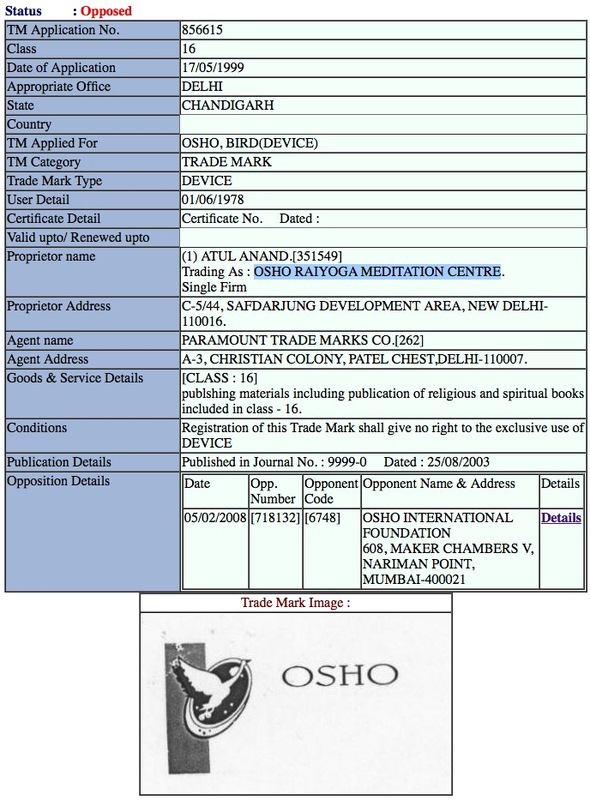 On Jul 28, 2000 the National Arbitration Forum, USA, denied complainant's (Osho International Foundation, USA) request that ownership of the domain name oshoworld.com be transferred from Osho Rajyoga Meditation Centre, New Delhi to them. There is an important difference between copyright ownership and a licence to publish copyrighted works. The first owner of a copyright, always the author, would issue licences to publish his works, or he could transfer ownership of his copyright to another legal entity. b) RF claims to be the copyright owner. Note that a transfer of ownership can only be established by verifiable original transfer documents. There seem to exist no verifiable, original transfer documents whatsoever between Osho and anyone else. Nonetheless, Osho International Foundation (OIF) claims to own the copyright of Osho's work. It has offered no proof of this. Moreover, its directors are involved in criminal charges, accusing them of forging an original document that would prove their ownership (see ref 1). 1960 Subject to the Indian Copyright Act of 1957, Osho owns the copyright to all of his written, transcribed and recorded work. 1969 On April 26, 1969 Osho allegedly signed a document that transfers his intellectual property rights to Jivan Jagruti Kendra. An original of the document has never been submitted and its authenticity is unknown. Therefore no transfer of copyright ownership between Osho and anyone else took place. The Acharya Shree Rajneesh Sahitya Publication Trust was set up to publish some of Osho's earliest books. Jivan Jagruti Kendra was incorporated on Jun 11, 1969, but published Osho's books under this name as early as 1962. 1973 JJK is renamed to Shree Rajneesh Foundation and subsequently registers Rajneesh Publications Pvt Ltd on Dec 10, 1973. 1975 According to a document, allegedly signed by Osho, JJK changed its name to Rajneesh Foundation "by court order dated 23 October 1975". There are no records of this name change at the Indian Ministry of Corporate Affairs. 1978 On Jul 28, 1978 Osho allegedly signed a document in which he issues to Rajneesh Foundation, India a licence to publish a small selection of his works. An original of the document has never been submitted and its authenticity is unknown. Therefore no transfer of copyright ownership between Osho and anyone else took place. The Shree Rajneesh Foundation incorporates on Oct 16, 1978 as Rajneesh Foundation Ltd.
1980 "© Bhagwan Shree Rajneesh" in The Heartbeat of the Absolute 1980, Arnold-Heinemann, New Delhi, India. This is the only known publication that acknowledges Osho's copyright. 1981 On Apr 1, 1981 Osho allegedly signed a document in which he issued to Rajneesh Foundation International a licence to publish a small selection of his works. An original of the document has never been submitted and its authenticity is unknown. Therefore no transfer of copyright ownership between Osho and anyone else took place. Also, RFI did not operate under that name until November that year. 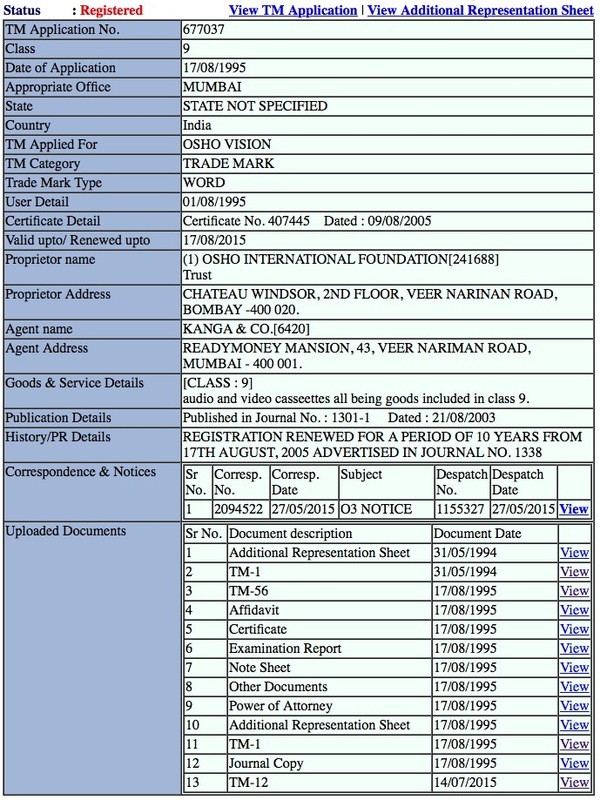 On the same day, Apr 1, 1981, another document purports to tranfer alleged ownership of copyright of Osho's work from Rajneesh Foundation, India to Chidvilas Rajneesh Meditation Center (later known as Rajneesh Foundation International). 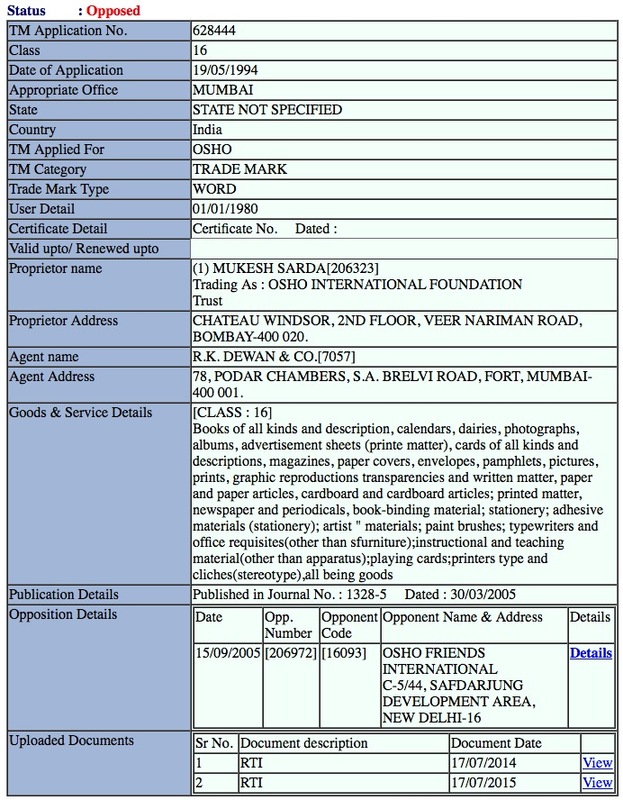 Since RF India did not own the copyright of Osho's work, this document has no bearing on the question of copyright ownership. Chidvilas Rajneesh Meditation Center incorporates on Jul 6, 1981. It changed its name to Rajneesh Foundation International on Nov 23, 1981. 1982 On May 1, 1982 Osho allegedly signed a Power of Attorney that among other things transfers his intellectual property rights and copyright ownership to Ma Anand Sheela. On the same day a Notary Public is said to have certified this document. Both these documents were allegedly presented by Sheela, someone who was convicted and jailed for crimes committed at the time. Last not least, the originals of these documents have never been submitted and their authenticity is unknown at best and probably forged. (see ref 7) Therefore no transfer of copyright ownership between Osho and anyone else took place. 1983 Sheela then allegedly on May 10, 1983 signs a deed that transfered all of her "rights" to Rajneesh Foundation International. The authenticity of this document is just as unlikely as is that of the Power of Attorney. 1984 On Nov 4, 1984 Rajneesh Foundation Europe is registered in Switzerland. 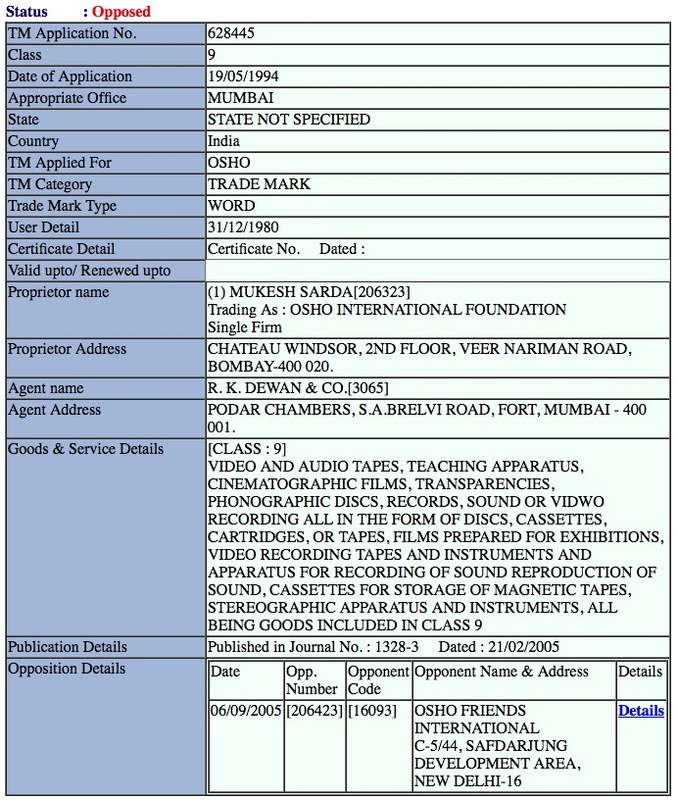 1985 On Nov 23, 1985 a document purports to tranfer alleged ownership of copyright of Osho's work from Rajneesh Friends International (previously known as Rajneesh Foundation International) to Rajneesh Foundation Europe (later known as Osho International Foundation. 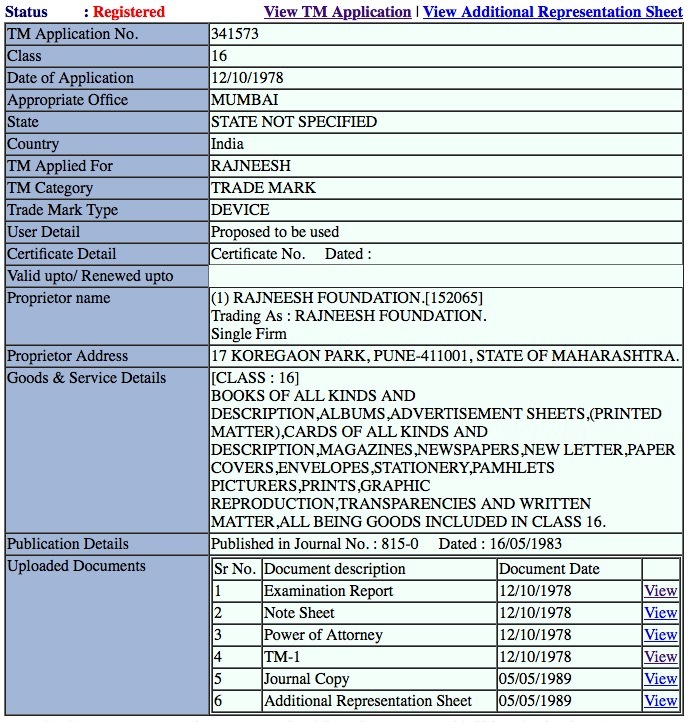 Since Rajneesh Friends International did not own the copyright of Osho's work, this document, if it is authentic, would have no bearing on the question of copyright ownership. Near the end of the ranch, on Oct 18, 1985 RFI changed its name to Rajneesh Friends International. On Nov 26, 1986 RFI was renamed to Chidvilas Foundation, Inc..
Chidvilas Foundation, Inc. is shut down on Aug 28, 1987. Sometime in 1988 Rajneesh Foundation Europe was renamed to Neo-Sannyas International Foundation. On Apr 25, 1990 Neo-Sannyas International Foundation changed its name to Osho International Foundation. 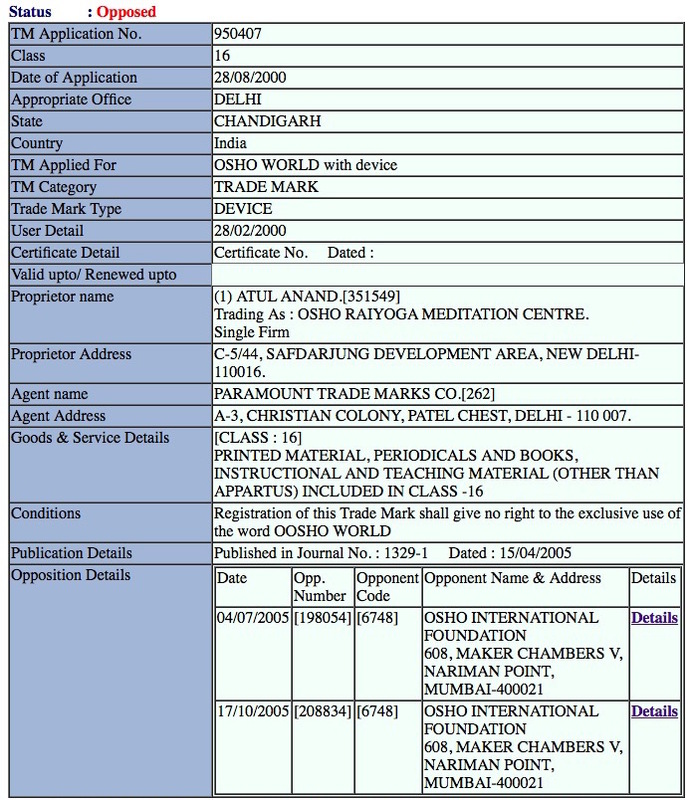 2013 On June 7, 2013 a will, allegedly signed by Osho, was submitted by OIF lawyers to the Office for Harmonization in the Internal Market (OHIM) stating a transfer of copyright ownership from Osho to the Neo-Sannyas International Foundation. This incident shows why original documents are of such vital importance when trying to prove a transfer of ownership of copyrights. If people are prepared to forge "original" documents, they will be even less hesitant to forge alleged copies of documents. And furthermore, documents of such value and importance don't just disappear or get lost. If they can't be submitted they probably never existed in the first place. From Bhagwan to Osho: What's in a name? This page was last edited on 25 January 2019, at 11:49.